East Palestine – K. Eudora Swaney Carpenter, 93, of 937 East Park Ave., Columbiana, formerly of East Palestine, died at 12:05 a.m. Monday, September 22, 2014 at the Salem Regional Medical Center. Eudora was born November 26, 1920 in East Palestine, the daughter of the late John Hutchison and Kathryn Corbett Morrison Conley. She was a 1938 graduate of East Palestine High School and a 1942 graduate of Carnegie Institute of Technology, Pittsburgh, PA with a B.S. degree in Secretarial Studies. She served as Assistant to the Administrator of the War Defense Training Program at Carnegie Tech from 1942-1944. She then served as bookkeeper at the former McCune Co. Farm Equipment in New Waterford and Youngstown and later was secretary for the late R. E. Charlton, Public Accountant in East Palestine. In 1974 she became a licensed funeral director and assisted her first husband, Glenn Swaney in the operation of the Van Dyke-Swaney Funeral Home, East Palestine until his death. She then owned and operated the funeral home until October 1, 1986, when John F. Kummer and Jon W. Rettig, Sr. became associated with the funeral home. 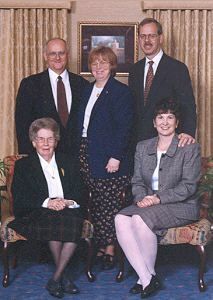 On January 1, 1998, Family Care Services, Inc. was established to own and operate the Van Dyke-Swaney Funeral Home, the Warrick-Kummer Funeral Home, Columbiana, and the Woods-Rettig Funeral Home, Leetonia and Eudora served as the first President of Family Care Services until December 1, 2012. Other than six years in Pittsburgh, she had resided in East Palestine most of her life until moving to Whispering Pines Village five years ago. She was a member of the First United Presbyterian Church where she had served as Ordained Elder, chairman of the Corporation, and was active in the Women’s Association. She was a member of East Palestine Chapter #381 Order of the Eastern Star, the Ohio Funeral Directors Association and the National Funeral Directors Association. She had also been a member of the former Twentieth Century Literary Club, the East Palestine Town & Country Garden Club and had served as chairman of the 1938 class reunion for several years. Her first husband, Glenn M. Swaney, whom she married June 14, 1947 died December 3, 1979 and her second husband, Jack R. Carpenter, O.D., whom she married May 9, 1987 died June 27, 2011. She was also preceded in death by a son in law, Michael Olive. She is survived by three daughters, Kathryn (Gregory) Doby of Princeton Junction, NJ, Martha A. Swaney of San Diego, CA, and Elizabeth Olive of Niles; two stepdaughters, Crystal Dover of Asheville, NC and Amy (Grant) Laing of Oakton, VA; three grandchildren, Eric Doby, Meredith Doby and Kathleen E. Olive; four step grandchildren, Julie (Chris) Shinn, Kevin (Kim) Dover, Kate Laing and Ryan Laing. Funeral services will be held at 12:00 noon Wednesday, September 24, 2014 at the Van Dyke-Swaney-Rettig Funeral Home, East Palestine with Pastor Kari Lankford officiating. Burial will follow in Glenview Cemetery, East Palestine. Friends may call from 10:00 a.m. until noon on Wednesday at the funeral home. East Palestine Chapter will conduct Eastern Star Services at 11:45 a.m. Wednesday at the funeral home. Material tributes may be made to East Palestine Alumni & Friends Scholarship Association, 116 Claybrook Drive, East Palestine, OH 44413. Jarrod T. Kane joined our family as a Licensed Embalmer and Funeral Director in February 2013. He is a graduate of the Cincinnati College of Mortuary Science where he earned a degree in Mortuary Science. He and his wife, the former Heather Bell are the parents of three sons, Morgan, Brennon, and Ethan. Wallace C. Rettig, 80, of 111 Summit Street, Leetonia, formerly of Holgate, Ohio, died at 4:00 a.m. Monday, February 20, 2012 at his home. Wally was born November 18, 1931 in Holgate, Ohio, the oldest child of William G. and Maggie L. Huber Rettig and was a 1949 graduate of Holgate High School. He served in the US Army 2nd Infantry Division in Korea where he was awarded the Bronze Star Medal. After returning from Korea, he met his wife, the former Nedra Jean Call of Defiance. They were married on October 10, 1954 and moved to Holgate, Ohio. Wally served as Mayor of Holgate from 1962 to 1965. Wally worked on the family farm as well as for Ron Zachrich Builders of Napoleon. He had also worked for his brother-in-law, Earl Edgar at the former Edgar Furniture in Defiance for several years. In 1977, he and his wife, Neddie, moved to Leetonia, Ohio where they partnered with their son, Jon Rettig in the ownership and operation of the Woods-Rettig Funeral Home in Leetonia. Wally attended Kent State University in Salem and received his funeral directors license in 1984. Although he retired in 1998, up until the last year he could be found helping out at the funeral home. He was an active member of St. Jacob’s United Church of Christ, Leetonia, the Lamplighters Sunday School Class and had been a very active member of the Leetonia Sportsman’s Club. Wally was a former member and past president of the Leetonia Ruritan Club and was a founding member of the Oakdale Chapel Building Committee. He was a member and Past Patron of the former Charity Chapter Order of Eastern Star in Holgate; a member of the former Leetonia Chapter and was currently a member of Salem Chapter #334 OES. He was a member and past Master of the former Holgate Lodge, F. & A.M. and was a member of Leetonia Lodge #401 F.& A.M. and Royal Arch Masons Chapter #92. He was currently a member of Joe Williams Post #131 American Legion of Leetonia, York Drexler Post #5532 VFW of Washingtonville, Columbiana County 40 & 8 #273, and the Tri-State Korean War Veterans Chapter 126. He had also belonged to various antique tractor and engine clubs including the Florida Flywheelers and was happiest when he was spending time with his grandchildren; hunting, fishing, shooting, and going to engine shows. Besides his parents, he is preceded in death by his wife, Nedra Jean on August 5, 2010. He is survived by a daughter, Lisa (Rick) Smith of Charlotte, NC; two sons, Jon (Ellen) Rettig, Sr. of East Palestine, OH and Kim (Elizabeth) Rettig of Tuscaloosa, AL; a sister, Joann (Mel) Schroeder Weber of Napoleon, OH; two brothers, Marvin W. (Brenda) Rettig of Lakeside, OH and Lynn C. (Elaine) Rettig of Plymouth, WI; a sister-in-law, Coral Edgar Stevens of East Palestine, OH; five grandchildren, Jon (Nicole) Rettig, Jr. of East Palestine, OH; Joshua Rettig, of Leetonia, OH, Joseph (Amanda) Rettig of Beavercreek, OH, Jean Rettig of Wilkes-Barre, PA, and Katherine Rettig of Fayetteville, NC; and a great grandson, Owen Joseph Rettig of Beavercreek, OH. Funeral services will be held at 11:00 a.m. Friday, February 24, 2012 at the St. Jacob’s United Church of Christ, Leetonia with the Reverend Jenna Brown, his pastor, officiating. Burial will follow in Oakdale Cemetery, Leetonia, where the Salem Honor Guard will accord military honors. Friends may call from 2-4 & 6-8 p.m. Thursday at the Woods-Rettig Funeral Home, Leetonia and one hour prior to the services at the church on Friday. Leetonia Lodge will conduct Masonic Services at 8 p.m. Thursday at the funeral home. Memorials may be made to St. Jacob’s United Church of Christ, The Charitable Foundation of the Salem Community Hospital, 1995 E. State St. Salem, OH 44460, or the Leetonia Sportsman’s Club Kids Day Fund. Leetonia - Nedra Jean Rettig, 83, of 111 Summit Street, Leetonia, formerly of Defiance and Holgate, Ohio, died Thursday morning, August 5, 2010 at her home following a brief illness. Nedra was born August 4, 1927 in Tedrow, Fulton County, Ohio, the youngest child of James Arthur and Martha Wenzel Call. She attended school in Fulton County and Wauseon until her junior year when the Wauseon School was destroyed by fire. She completed her senior year at Defiance High School where she graduated in 1935. While working as a waitress at the former Wellman's Restaurant in Defiance, she met a returning Korean War Veteran, Wallace C. Rettig. They were married on October 10, 1954 and moved to Holgate, Ohio. In addition to being a homemaker, farm wife, and mother to three children, Neddie worked as a dietary cook at the former Northcrest Nursing Home in Napoleon for 9 years. In 1977, she and her husband, Wally moved to Leetonia, Ohio where they partnered with their son, Jon Rettig in the ownership and operation of the Woods-Rettig Funeral Home in Leetonia. Neddie served as receptionist and funeral assistant for over 33 years, working up to the last six months of her life; greeting and comforting hundreds of people who came through the doors. She was an active member of St. Jacob's United Church of Christ, Leetonia, the Lamplighters Sunday School Class and the Women's Guild. She was a member and Past Matron of the former Charity Chapter Order of Eastern Star in Holgate; a member of the former Leetonia Chapter and was currently a member of Salem Chapter, #334 OES. She was past president of District #7 OES and past president and member of William F. Helmke American Legion Auxiliary, Holgate, where she served as Americanism Chairman for many years. She was currently a member of Joe Williams American Legion Auxiliary of Leetonia and Salon #432 8 & 40 of Columbiana; the Thursday Reading Club, Leetonia and the Gideon's Auxiliary. She was a member of Church Women United and also volunteered at the Help Center in Lisbon. She is survived by her husband, Wallace C. Rettig, a daughter, Lisa (Rick) Smith of Charlotte, NC; two sons, Jon (Ellen) Rettig, Sr. of East Palestine and Kim (Elizabeth) Rettig of Tuscaloosa, AL; a sister, Coral Edgar Stevens of East Palestine; and five grandchildren, Jon (fiancAC. Nicole) Rettig, Jr. of East Palestine; Joshua Rettig, of LaPlata, Argentina, Joseph (Amanda) Rettig of Beaver Creek, Jean Rettig of East Palestine, and Katherine Rettig of Fayetteville, NC. She was preceded in death by two sisters, Lucile Max and Dorothy Palmer; and three brothers, Jay Call, Blaine Call, and Leon Call. Funeral services will be held at 11:00 a.m. Monday, August 9, 2010 at the St. Jacob's United Church of Christ, Leetonia with the Reverend Jenna Brown, her pastor, officiating. Burial will follow in Oakdale Cemetery, Leetonia. Friends may call from 2-4 & 7-9 p.m. Sunday at the Woods-Rettig Funeral Home, Leetonia and one hour prior to the services at the church. Salem Chapter #334 will conduct Eastern Star Services at 6:30 p.m. on Sunday at the funeral home. Memorials may be made to St. Jacob's United Church of Christ or The Luke Commission, P.O. Box 1335, Sagle, ID 83860.